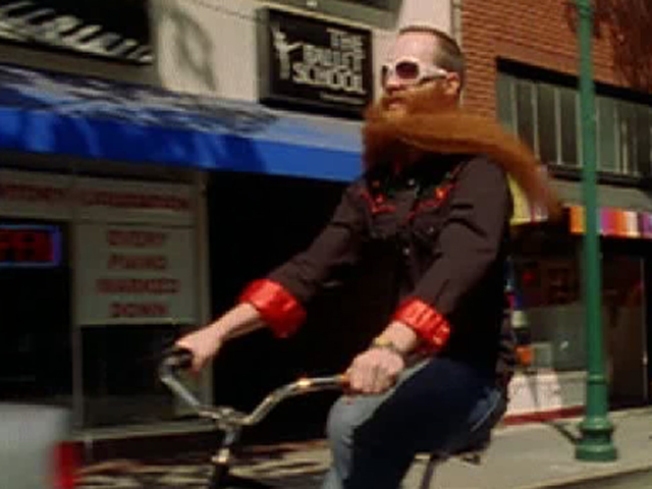 Jack Passion lets his beard flies as he rides a bike down the streets of Palo Alto. Beards are back. From the hipsters with their chinstrap three o'clock shadows to your college professor with his Sigmund Freud look. And the Bay Area is taking center stage at the facial fashion accessory. World beard champion and Bay Area resident Jack Passion joins a cast of Bay Area bearded dignitaries in the short film "The Secret Life Of Beards." The humorous documentary, directed by Stanford alum Melanie Levy, lets bearded men such as Passion, a singing Santa Claus impersonator, religious figures and more explain why they keep their beards and what it means to them. A few even offer tips about how to grow your own stylish mane and keep it looking clean, like Passion's fiery red chin locks, which drop down to his waist on a good day. Check out the movie below and if you like it vote it up at the Portable Film Festival. The movie will also be screened at the SF Doc Festival this month and it will be shown at the Redhook Film Festival in New York this weekend.